In recent years the M&A activity in Slovenia has been driven by the state’s decision to divest state shares in wholly or partially state-owned companies (namely to undergo a third privatisation wave). Since 2015 when the parliament adopted the Ordinance on State Asset Management, which set forth conditions of asset management and classification of investments according to which the state will divest and privatise state-owned companies, Slovenian sovereign holding and other managers of public assets (such as pension fund managers) underwent several sales process in which in principle they did not discriminate between private equity investors relative to traditional strategic industrial buyers. Although some sales processes ended unsuccessfully (such as that of Telekom Slovenije d.d. and Nova Ljubljanska banka d.d.) and though in 2017 the privatisation of state-owned companies ceased to be the key source of M&A activity in Slovenia, the privatisation process is expected to continue in 2018 and 2019 (albeit at a reduced speed owing to upcoming parliamentary elections in 2018). This means that private sales processes driven by private sellers and buyers have become the main driver of M&A activity in Slovenia in 2017. The importance of private deals for the M&A activity is expected to increase also in 2018. According to our assessment and considering that no official data or statistics are available, the level of private equity transactions in 2017 slightly dropped compared to the levels from previous years. 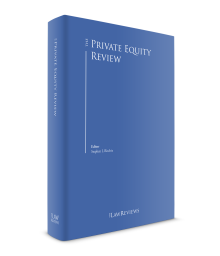 After a decline between 2008 and 2012, private equity transactions gained momentum in 2014, and their level has steadily grown until 2016. In 2017 a slight drop occurred due to decreased in the volume of sales driven by the privatisation, whereas at the same time private transactions only began unwinding in the second half of 2017. According to some interpretations, the level of activity in 2016 and also in 2017 (despite a slight drop in activity in 2017) exceeded the levels reached in 2007. However, such view may be subject to interpretation and discussion, since Slovenian Securities Market Agency data show that M&A activity in Slovenia in 2016 remained significantly lower than in the years prior to the financial crisis.2 However, our position regarding the level of private equity activity also takes into account the fact that the Slovenian Securities Market Agency does not include transactions that are not subject to the Slovenian Takeovers Act in its report. The latter means that the data analysed by the Securities Market Agency (although the only available data, and the best approximation to the actual market size and structure) does not include the vast number of smaller, yet still important, transactions. In addition, the numbers for 2007 also included management buyout transactions reflected in the extremely large market value data – the data on the value of transactions in 2007 exceeded the yearly average in the years from 2002 to 2005 by more than three times. The data above and our experience in the field of structuring and advising on private equity transactions to various buyers suggests that private equity transactions are expanding and have taken over a significant portion of the M&A market in Slovenia. Operations of the private equity market in Slovenia do not significantly differ from the classical acquisitions carried out by traditional strategic (industrial) buyers. The standard sale process usually includes several phases, starting with addressing potential buyers with a teaser and information memorandum containing information about the target (when the state is selling its stakes in companies, public invitations to submit a bid are published to address a very broad investor base) followed by a stage during which an interest to purchase the investment is presented to the opposing party. The latter stage is usually followed by due diligence, a decision of the seller and the buyer as to whether they wish to enter into further negotiations on the terms of the deal, actual negotiations, the signing of the agreement and finally closing (completion) of the deal, which follows the fulfilment of conditions precedent, if applicable.3 The latter usually include obtainment of certain approvals and consents by regulatory agencies, if necessary.4 The length of the sales process depends on the structure of the transaction. Simple share sales in smaller companies may be finalised in a couple of weeks (starting with initial contact between the seller and potential buyer, and ending with the transfer of shares). On the other hand, completion of all major transactions takes longer, since they usually include comprehensive due diligence, buyers are required to obtain certain permits and (regulatory) approvals, and sellers usually perform negotiations with several potential buyers and, therefore, need more time to shortlist the bidders and finally adopt a decision on the best (the most suitable) bidder. In particular, sale processes involving state-owned companies may take longer until completion, even up to nine months. Our experience enables us to say that investors (a private equity firm or fund that acquires the target) are striving towards achieving and ensuring smooth transition and integration. One of the important aspects of such transition is also the arrangements with the management of the target. In some cases investors decide to continue a business relationship with the incumbent management, whereas in other cases they wish to expand the management by appointing additional executive officers or appoint a completely new management. Slovenian legislation does not restrict incentives through management ownership. The content of such arrangements varies from one company to another and fully depends on the individual agreement between the shareholders and the management, whereby the Slovenian Companies Act expressly lists a shares and options remuneration scheme as a method of incentivising the management. Shareholders in a limited liability company may freely determine the remuneration for management, whereas in joint-stock companies shareholders may influence the remuneration and may incentivise management via a remuneration policy adopted in accordance with Paragraph 7, Article 294 of the Companies Act.5 If shareholders have not adopted the remuneration policy, the supervisory board still needs to follow the criteria set forth by the legislator with regard to the remuneration policy, and in this case it is up to the supervisory board to assess what the content of the management agreements will be. The structure of the transaction depends most and foremost on the organisational form of the target company. The majority of transactions involve acquisitions of shares in joint-stock companies or business shares of limited liability companies, which are two of the most notable organisational forms of companies under the Companies Act. When a specific private equity investment is made into a Slovenia-based company, the core of the transaction remains the same. This means that the sole acquisition of shares (the method and required step for the transfer of ownership over shares) depends solely on the organisational form of the target. If the private equity entity is buying a business share in a limited liability company, a sale and purchase agreement needs to be entered into in the form of a notarial deed whereby the transfer of the business share becomes effective (in relation to third parties and against the target itself – the acquirer obtains rights and obligations against the target) only after the buyer is entered in the court register (as the holder of the business share). On the other hand, if the target is organised in the form of a joint-stock company it is not required that the share sale and purchase agreement is entered into in any specific form other than that the agreement is in writing. In this case, the transfer of shares (stock) occurs after the acquired shares are entered in the buyer’s dematerialised securities (trading) account held with the Central Clearing Corporation (having a position of a central securities depository) and operated by its member.6 In practice, parties usually agree on the delivery-versus-payment closing mechanism, including appointing an escrow agent (in the case of transfer of shares, usually the Central Clearing Corporation, in the case of transfer of business shares, usually a public notary). In addition, the structure of the transaction further depends on whether specific provisions of the Companies Act regulating the pre-emptive rights of other existing shareholders should be considered and applied, whether the target (which is organised as a joint-stock company) in its articles of association provides that the company needs to consent to the transfer of shares, whether the Slovenian Takeover Act applies (specifics of mandatory takeover offers are discussed in Section IV, infra), whether the transaction is subject to the merger control rules and whether any specific rules should apply due to the specifics of the business activities of the target. All of the above means that there is no significant difference between transactions when the investor is acquiring control over the target and transactions when the investor acquires only a minority stake. The main differences are related to the question of whether the transaction is subject to the mandatory takeover rules and whether the transaction constitutes a concentration that might trigger the obligation to obtain a merger clearance. There is also no material difference when the acquirer is domiciled outside Slovenia. Such acquirer should obtain a Slovenian tax number, in some cases (in asset deals where the acquirer obtains ownership over real estate) the acquirer should also obtain a registration number, and if the transaction refers to shares (stocks), then the acquirer should open a trading account with one of the Central Clearing Corporation members. Several recent acquisitions were conducted through special purpose vehicles (SPVs) established in Slovenia. All administrative issues that need to be resolved when a foreign investor is investing in Slovenian companies through a domestic SPV do not significantly and materially affect the transaction, since all stated procedures are relatively straightforward. In 2017, amendments to the Prevention of Money Laundering and Terrorist Financing Act came into force, which set forth stricter KYC and AML rules, particularly in respect of disclosing ultimate beneficiary owners in the register of de facto owners. According to Article 264 of the Companies Act, any person who uses his or her influence to induce members of the management or supervisory board, a procurator or proxy to act to the detriment of a company or its shareholders shall compensate the company for the resulting damage. Although there is no explicit case law that would deal with situations when such third person would be another shareholder, Slovenian legal theory advocates that even shareholders should be held liable for their unlawful influence on the company’s operations, and that in most cases majority shareholders would be held liable for forcing the management to act to the detriment of the company. This means that private equity investors in some situations might be held liable for damage incurred to the company due to their actions as shareholders. On the other hand, there is no uncertainty with regard to the existence of the fiduciary liability of the members of the management or supervisory board of the company. The members of the management or supervisory board may be held liable under Article 263 of the Companies Act, which sets forth the legal standard of their professional diligence. Managers and supervisory board members, regardless of their affiliation with a certain shareholder, must, while performing their duties on behalf of the company, act with the diligence of a conscientious and fair manager and safeguard business (and trade) secrets of the company. Such fiduciary duty of management and supervisory board members includes both their accountability towards the company, and their liability to creditors of the company. As already discussed in Section I, supra, the private equity market in Slovenia remains vibrant, especially as a consequence of the increasing number of foreign private equity investments. The latter are dispersed throughout the extensive range of business sectors. In recent years, the overall M&A activity depended vastly on the privatisation process (public-to-private transactions), whereby in 2017 sales of (either majority or minority) stakes in smaller privately owned companies gained importance in the search for new capital required for growth and penetration in foreign markets. In addition, and which may be considered specific to Slovenia in recent years, a significant increase in two-stage transactions may be detected. As a result of the recovery of the banking sector through sale of claims by the state-owned Bank Assets Management Company (BAMC),7 potential investors in the first stage buy the claims from the Bank Asset Management Company (and maybe also from some other privately owned foreign banks), then at the latter stage execute the capital increase by a debt-to-equity swap, thereby acquiring the target. In 2017, the market remained vibrant. After a successful acquisition of TKK Srpenica, a leading world producer of the polyurethane foam and other chemical products, in 2012, Soudal Holding, Europe’s leading independent manufacturer of sealants, PU-Foams and adhesives, continued its expansion on the Slovenian market by its 2017 acquisition of an adhesives producer Mitol.15 Similarly, only in the financial sector, NKBM (acquired by Apollo in 2016) was expanding its business operations in Slovenia through an acquisition of Summit Leasing, a leading automobile leasing house in Slovenia. If in 2015 and 2016 the majority of acquisitions pertained to traditional sectors (such as banking), 2017 is special also because the majority of acquisitions occurred in sectors that are considered niche. For example, Petrol, a leading Slovenian energy company, acquired a 76 per cent stake in mBills, a fintech company developing a mobile valet. On the other hand one of the largest suppliers of process technology for the food industry Gea Group acquired Slovenian Vipoll, a manufacturer of filling technologies.16 Although majority of acquisitions in Slovenia in 2017 were executed by private strategic investors, acquisitions by private equity investors were not legging behind. Largest, by value, acquisition in 2017 in Slovenia was KKR’s (KKR & Co LP) acquisition of Pro Plus, a Slovenian leading media company.17 Among private equity funds HPS Investment Partners executed a notable acquisition of Merkur Trgovina for €28 million.18 In addition to the above-mentioned transactions, there were several other private equity market entrances in 2016 and 2017, although details of those transactions may not be disclosed, according to our estimates the annual aggregate value of these transactions is roughly €80 to €100 million. The question of financing private equity transactions has raised many issues in the past in Slovenia. Debt and leveraged finance has been seen in certain notable transactions. In addition, we can also say that a significant number of those debt financing transactions, especially where acquirers come from Slovenia or regional countries (Bulgaria, Croatia, Serbia, etc. ), constitute leveraged buyouts. The sources of such financing are diverse and vary from transaction to transaction. In general, buyers obtain debt finance from bank loans or bonds issuances. In some cases transactions are also financed through mezzanine and second lien financing. Pursuant to the Companies Act, any transaction resulting in financial assistance of a joint-stock company (to the buyer of its shares) is null and void, and therefore the target company may not provide finance or security for acquisition of its shares. The latest 2015 amendment of the Takeover Act similarly imposes also the obligation of the buyer (the offeror) to prove to the Securities Market Agency (in the procedure for the issuance of permission to announce a mandatory takeover offer) that the target’s assets are not used and shall not be used (directly or indirectly) as collateral for obligations arising from acquisition finance used as consideration in the takeover. The same obligation applies also to the target shares (subject to the mandatory takeover offer) that are not yet held (owned) by the offeror. As a result, the offeror must not grant or undertake to grant a pledge over such shares as security for acquisition financing. a loan to a legal entity where (1) a shareholder or (2) a member of the management or (3) its family member or (4) all of persons from (1) to (3) hold at least a 10 per cent controlling share (i.e., in the capital or voting rights). As far as the terms of recent control transaction agreements are concerned, almost all acquisition agreements contain provisions that regulate the closing procedures (if the finalisation of the acquisition is conditioned with closing), provide for the warranties of both parties, and set forth the mechanism and rules for the indemnification. Particularly in recent transactions, representations and warranties provisions have gained importance, which is a result of foreign buyers being lenient towards such provisions. Provisions on the conditions precedent are sometimes extensive and comprehensive, which is especially true in regard to transactions in which the acquirer needs to obtain certain permissions or when the seller undertakes that the company will divest non-core business assets. However, the terms of each individual transaction are negotiated according to the needs of the seller or the buyer and considering the specifics of each transaction. This means that no provisions are per se included in or excluded from the transaction documentation. Certain changes in trends in 2016 and 2017, mostly related to the fact that quite a considerable number of deals related to the recovery of the banking sector through sales of claims, may be detected. In this context, we have seen a lot of acquisition opportunities related to carve-outs or asset deals. Furthermore, the structure of several deals in 2016 and 2017 included some type of capital increase, and the providing of working capital to the target or refinancing of the target’s financial debt significantly affected the key terms of the transaction. Last but not least, deferred consideration or earn-out provisions and price adjustment mechanisms formed a significant portion of transaction negotiations. No notable exits occurred in 2017. There were several smaller exits of both Slovenian-based and foreign private equity funds that divested their investments mostly in state-owned companies that were sold in 2016 and 2017. However, according to our information, all such private equity investors remain involved in the Slovenian private equity market; therefore, their exits from certain portfolio investments cannot be considered exits from Slovenia. According to Article 24 of the Takeover Act, the potential buyer must, prior to making a takeover bid, notify the Slovenian Securities Market Agency, the target’s management and the Slovenian Competition Agency of its intention to make the takeover bid. Within 30 days, and not before the expiry of 10 days after the publication of the intention to make the takeover bid, and in any case after the investor obtains permission to make the takeover bid from the Slovenian Securities Market Agency, the investor needs to publish the takeover bid, which includes the bid itself, the offer document and the prospectus. To obtain the Agency’s permission, the investor needs to fulfil certain conditions set forth in Article 32 of the Takeover Act.22 After the expiry of the takeover bid, the acquirer needs to publish the result of the bid, whereby the success of the bid needs to be confirmed by the Securities Market Agency. After the issuance of the Securities Market Agency’s decision announcing the takeover bid as successful, the Central Clearing Corporation then executes all appropriate steps required to enter the (takeover) shares on the offerror’s account of dematerialised securities, with the effect that the offeror becomes the lawful holder of the shares. in the last financial year, the annual turnover in the Slovenian market of the target undertaking together with other undertakings within the group exceeded €1 million or, in the case of the formation of a full-function joint venture, the annual turnover in the Slovenian market of at least two of the undertakings concerned together with other undertakings within the group exceeded €1 million. A concentration has to be notified to the CPA at the latest 30 days after the conclusion of an agreement, announcement of a public bid or an acquisition of control (the time period of 30 days runs from the first of any of these events) or, in the case of a voluntary notification, within 15 days after the CPA requests notification. Pre-notifications are not expressly regulated but are possible in practice. Notification needs to be submitted to the CPA on a standard concentration notification form, which guides the applicant to provide the CPA with all relevant information with regard to the concentration that is being notified. In addition, certain specific acts prescribe that the acquisition of certain thresholds – qualifying holdings – requires approval of the competent authority, for example, the Bank of Slovenia, the Slovenian Insurance Supervision Agency, the Securities Market Agency and the Ministry of Culture. In particular, such approvals for the acquisition of qualifying holdings are seen in sectors such as banking, insurance, finance and media. According to publicly available information, M&A activity in 2018 in Slovenia is expected to be dynamic. Major developments are expected to occur in the banking sector, where the sales process of Gorenjska banka is already underway (Serbian AIK banka AD Beograd, which already holds a 20.1 per cent shareholding in Gorenjska banka, published a takeover bid for Gorenjska banka in late December 2017). After an initial halt in the privatisation of Nova Ljubljanska banka, it is expected that after the June parliamentary elections, the sale of Nova Ljubljanska banka will continue. A sales process of Abanka d.d. is also expected to commence in 2018. In addition to the latter expected developments in the banking sector, other sectors will most likely remain subject to growing M&A activity. An important retailer, Tuš Holding, is expected to be on sale also in 2018 (several banks are selling non-performing loans against Tuš Group in the amount of €300 million, whereas the latest sales process to Quantum Strategic Partners was unsuccessful). In 2017 Unior (one of the largest and most important Slovenian exporters, which operates in four production segments: forged parts, hand tools, machine tools and tourism activities) underwent a reorganisation, which some see as initial steps towards Unior’s sale that might occur in 2018. Mariborska Livarna Maribor (a supplier of parts and tools for automotive industry) is already in the sales process. It is also being speculated that some privately owned companies could also be on sale in 2018, whereas no official announcements of expected sales were made as of yet. All of this suggests that the M&A market will be vibrant and that it will grow. Positive experiences with private equity investors, which were just a few years ago considered as a poorer alternative to traditional strategic buyers, raise our expectations that private equity (especially foreign) investors will remain the driving force of the privatisation of state-owned companies, especially considering some news reports that several private equity funds might invest into Slovenia in the near future. In addition, such investors, based on the positive experience in the last wave of privatisation, could also play an important role in sales of private companies in various sectors. On the other hand, we are witnessing certain adaptations of the Slovenian business environment, which is becoming more and more investor-friendly. In the past, governments of different political orientations have tried to reduce administrative barriers for investors, both national and foreign, and to shape a smart tax environment, which has already been reflected in an increase in investment activities. We are, therefore, of the opinion that no significant and material adverse legislative changes are to be expected in the near future, since all stakeholders are aware of the importance of a stable and predictable business environment. While there could be some minor legislative interventions, according to a popular and universally accepted belief, especially in 2018, which is an election year, such interventions should aim to strengthen and boost a competitive economy. 1 Gregor Pajek is a partner and Aljoša Krdžić is a senior associate at Rojs, Peljhan, Prelesnik & partners o.p., d.o.o. 2 Slovenian Securities Market Agency, Report on the status and conditions in the field of financial instruments market for 2016, p. 11, June 2017, available in Slovenian at www.a-tvp.si/Documents/Porocilo_o_stanju_in_razmerah_na_trgu_2016.pdf. 3 This is a very simplified ‘standard’ sale process. Recently we have seen also approaches where investors were invited to participate in a capital increase completion, which subsequently may trigger a mandatory takeover offer (to the extent the company falls under the definition of ‘target company’ set forth in the Takeovers Act). 4 Regulatory requirements are dealt with separately under Section IV, infra. 5 Paragraph 7 of Article 294 of the Companies Act stipulates that the remuneration policy shall foster the long-term sustainability of the company and provide that the remuneration is commensurate with the results and the financial position of the company; that the total remuneration may be composed of a fixed and a variable part, whereby the variable part of the remuneration shall depend on measurable criteria defined in advance; and that severance pay may be paid only in the case of early termination of a contract. 6 The seller and the buyer provide their Central Clearing Corporation members with the bilateral orders (delivery and acceptance order, whereby these two orders need to be paired), and on the basis of such paired orders the Central Clearing Corporation transfers the shares from the seller’s trading account on to the buyer’s trading account. A list of Central Clearing Corporation members includes all major banks present in Slovenia and also some brokerage companies. The investor may choose freely which member of the Central Clearing Corporation will open a trading account on its behalf. 7 The BAMC is a joint-stock company that was established in March 2013 as a company owned by the Republic of Slovenia with the task of facilitating the restructuring of banks with systemic importance that were facing severe solvency and liquidity problems. By the end of 2013, the two largest banks had been recapitalised by the government, and a substantial part of their non-performing assets had been transferred to the BAMC (source: www.dutb.eu/en/about-us). The BAMC is also referred to as the ‘bad bank’. 11 Slovenian Sovereign Holding, www.sdh.si/en-us/Novica/1404. 12 Slovenian Sovereign Holding, https://www.sdh.si/en-gb/news/1514. 19 Paragraph 1 of Article 11 of the Takeover Act defines the takeover bid as a ‘public offer made to all holders of the securities to conclude a contract, which, when accepted, shall result in a contract on the acquisition of such securities between the offeror as the buyer and the accepting party as the seller’. 20 The takeover bid also needs to be made or renewed by the offeror who, following a successful bid, has acquired 10 per cent of the voting rights, and the obligation to renew a bid shall cease when the offeror, following a successful bid, has acquired at least 75 per cent of all the target company’s shares carrying voting rights. 21 In addition to the obligations under the Takeovers Act, any acquisition below and above the takeover threshold is still subject to a requirement to notify the target company of any acquisition of a ‘major shareholding’, these being set at 5 per cent, 10 per cent, 15 per cent, 20 per cent, 25 per cent, one-third, 50 per cent and 75 per cent of all voting rights in the target company. 22 For the purpose of this chapter we explicitly emphasise the investors’ obligation to provide the Securities Market Agency with the proof that the acquirer has deposited at the Central Clearing Corporation the full amount of consideration in cash required for paying of all securities subject of the takeover offer. Instead of cash, the acquirer may also deposit a bank guarantee covering payment of consideration by the offeror.